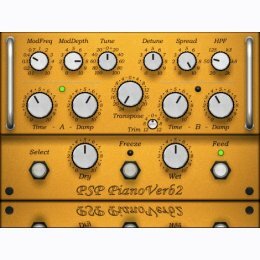 PSP PianoVerb2 is a redesigned and improved creative resonant reverb plug-in (VST, AAX and RTAS for Windows; AudioUnit, VST, AAX and RTAS for Mac OSX) plug-in based on their famous and beloved freeware plug-in PSP PianoVerb. Like the original PianoVerb it creates its unique sound with twelve resonant filters that mimic the behavior of piano strings. The ability to transpose, tune and detune the set of strings allow you to set up PianoVerb2 to deliver a wide range of reverberations ranging from traditional wide spread reverb to unique and unusual resonances. With the addition of a brand new modulation section and the ability to set up multiple settings of time and damping and decay freezing (via A/B comparison function) this little plug-in delivers amazing options for creative use. Add to that some other amazing new additions such as a high pass filter section, independent dry/wet controls and a reverb tail freeze control, and you can see just how PianoVerb2 has become a truly comprehensive and unique algorithmic reverb. Whenever you want to add some natural resonance to a weak piano track, vitalize your leading guitar with a bit of sustain or simply add a touch of a nice reverb to the selected track, PSP PianoVerb2 can do the job!